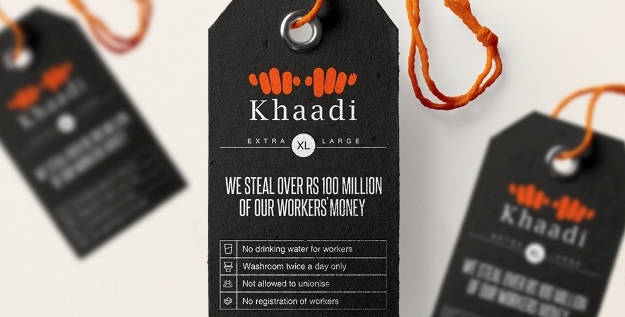 KARACHI: Pakistan’s famous apparel brand Khaadi is stealing over a hundred million rupees from its hardworking labourers every year by not registering them with social security institutions. The National Trade Union Federation (NTUF), which is representing Khaadi workers in their dispute with the company management, says that the owners are pocketing huge profits by submitting flawed records to government institutions that helps them save money. Data available with The Express Tribune also shows how by disowning the workers, the country’s favourite apparel brand is depriving workers of their due rights and money for even more profits. In June this year, Khaadi had agreed to meet all the demands put forward by its worker and its representatives. It had agreed to ensure the implementation of labour laws in its manufacturing units and issue social security cards as per the industrial rules and regulations. However, the bosses at Khaadi are yet to keep their word. In fact, conditions have further worsened at the factories where Khaadi products are manufactured. Every company in the country is required to register its workers for ensuring the provision of their due rights. In Khaadi’s case, the brand is bound by Pakistan’s law to have its workers listed with the Sindh Employees’ Social Security Institution (SESSI) and the Employees Old-Age Benefits Institution (EOBI) and have their cards issued for their welfare in accordance with the Constitution and the rules set by International Labour Organisation (ILO). However, over the past few months, Khaadi has not only defied the law and broken its agreement with the workers, the popular brand has also illegally forced organised labourers to leave its units because they were protesting for their rights. Khaadi has repeatedly changed its responses over the matter which arose in the beginning of the year with workers deploring and protesting against terrible working conditions at the brand’s manufacturing sites. The workers claimed that they were not allowed to go to the washroom, not provided with water, not paid the minimum wage and deprived of social security. The company also fired over 30 of its workers despite the standing order of a court in their favour . Labour abuse: Is Khaadi’s ‘third-party vendor’ TexMark actually a Khaadi-owned operation? The company responded by saying that Khaadi had a third-party contract with TexMark and it was the latter’s responsibility to ensure the implementation of labour laws there, a statement which was disproved in an earlier report of The Express Tribune. TexMark is essentially a Khaadi-owned business venture — established soon after the workers started unionising against labour rights violation — to save its brand name. Be it Khaadi or TexMark, as the brand calls itself to hide its malpractices, the apparel company is accumulating a large sum of money every year by not having their workers registered as it would ensure provision of their rights which come at a cost. An upper-brass EOBI officer told The Express Tribune on the condition of anonymity that every company having factories in Pakistan was required to register its workers with the institution and pay Rs780 per month for each worker so that they could be eligible for social security once they retired. Of this amount, Rs130 is paid by the worker every month, whereas the remaining Rs650 is paid by the employer. Khaadi has not registered its workforce with SESSI either, saving Rs850 (6 per cent of the minimum wage) per labourer every month. Simple mathematics can expose how much money is Khaadi stealing from the workers. Khaadi workers claim their employer cuts their share of the EOBI amount from the salaries but has not provided them with social security cards so far. The available data shows that Khaadi – operating since 1999 – or TexMark has not registered their workers with the EOBI. Around 6,000 workers are associated with Khaadi in Karachi alone but hardly 300 of them are listed with the social security institution, the EOBI data reveals. Here is the EOBI data showing that in various manufacturing units of Khaadi (or TexMark), only a handful workers are registered. The above picture shows the data of a Khaadi’s manufacturing unit where around 2,000 workers are employed but only 50 of them are registered. The company also disowns its factory and says it belongs to TexMark, whereas the data and workers confirm that the former is its owner. The data on TexMark, a second name for Khaadi to evade labour laws, shows only 115 workers registered with the EOBI whereas the total number of the workforce is around 3,000. Shabbir Khan, a young Khaadi worker who is leading the informal union at one of their manufacturing units, told The Express Tribune that instead of working on their demand for social security cards, Khaadi managers say they will provide them with ATM cards. The clothing brand refrains from owning its hardworking labourers and claims that they have been hired through a third-party contract – a fictitious employer-and-employees relation which has been termed illegal by Pakistani law and Supreme Court. In light of the historic Supreme Court verdict of 2013 against third-party contracts and certain law clauses, it is illegal for any company to relieve itself of responsibility of its workers by handing the manufacturing task to a vendor, says Karamat Ali, a veteran human and labour rights activist long associated with Pakistan Institute of Labour Education and Research (Piler). The labour rights expert says that Khaadi should accept that it is its own workforce which makes its production possible. He cites the Industrial and Commercial Employment (Standing Orders) Ordinance, 1968, which states that any company which has 20 or more labourers who are employed to work more for more than three months of time should deem these employees their own and make them permanent. He goes on to warn that this dispute might force the European Union (EU) to take notice as Pakistan is a beneficiary of the Generalised System of Preferential (GSP+) scheme which allows it to export products without duty. “The EU will investigate the issue if they don’t mend their ways. They will be held accountable by the union itself and they can backtrack on the GSP+ Scheme with Pakistan,” he says. The activist further elaborates that Pakistan is already going through a hard time as is depicted in the recent budget and losing this scheme, which gives us a hefty benefit of $1.3 billion, could result in disaster for the economy. Ali went on to urge the government to intervene and act against the Khaadi management. The Khaadi spokesperson, when contacted, did not respond to the questions related to the above-mentioned data. Khaadi’s failure to get its workers registered with the social security institutions is just the tip of the iceberg, and much more remains to be unravelled. Even more frightening is the fact that it is not just Khaadi exploiting the workers. The rot plagues the entire textile industry wherein workers remain deprived of the basic rights they deserve. Khaadi and all other such companies that do not register their workers with EOBI should be punished by the consumers. They not give EOBI card of his employ who was work there 20 years on key post.